The first few weeks of Tech Club have been very exciting! Students from Central Manor and LeTort elementary schools have had the chance to see inside laptops and a desktop, and learned about some of the parts of a computer. Some students at LeTort had the chance this week to replace hard drives in some student laptops that had bad ones. 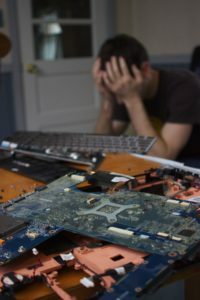 This was the first time any of them had seen a ribbon cable or interacted with connectors on a motherboard. Several of them were able to replace the hard drive and watch it successfully boot up. We’ve also started experimenting with some software that they will use to make a project. Some of them are interested in making graphics for the project, so I’m showing them Inkscape. 6th grade at LeTort will be making a webpage so they’re being introduced to HTML and CSS. Others will be working with Scratch to make their very own computer game! Scratch is designed as a platform to teach the basics of programming. One of the teams has already made an intro screen, and the other team using scratch has worked out some of the controls for their game. Both games will focus on Mariner 2, a spacecraft that is our theme this year. They have one full month yet until the end of this cycle to work on their project. It will be interesting to see what they develop. If you have it in your lesson plans, Subs can use your document camera with a student laptop connected to a projector. First, have them follow this Tech Tip to connect a student laptop to a projector. 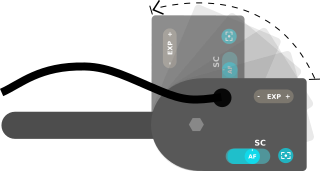 Now, connect the document camera and follow these steps. Click on the cog in the upper left of the screen on the student laptop. Type “cheese” in the search bar. Maximize Cheese to make it bigger. You can position the head of your document camera to get the best picture. Today was the first Tech Club meeting at LeTort. Central Manor will start tomorrow. These kids seem very enthusiastic about technology and are excited to start doing things. Each tech club member is getting a small 3d printed wrench with their name on it. For our first day, I’m starting by showing them what a hard drive is and letting them take one apart to see the working parts inside of it. This group seems pretty interested in doing some things with video and programming, so I’ll be looking for some activities to inspire them. They were all very excited to participate and they did a great job, especially considering that this was their first time using Google Slides. This opens the door for future projects at this grade level, so I’m excited to see what they will create! Who would have thought that a single application could do so much for elementary students? 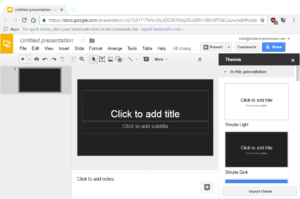 Throughout this school year, I’ve worked with teachers to guide students in using Google Slides to make presentations about something they are learning. The results have been amazing. Making slides is an incredible learning tool. It’s a creative outlet where they can make something that teaches others, and reinforces things they’ve learned. But best of all, it encourages children to ask questions, do their own research, and make something of their own from scratch. This isn’t just about producing content, it’s about giving children the opportunity to be inspired and to inspire others. 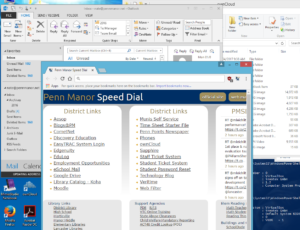 Students at Penn Manor can make slides by logging in to Google drive and clicking on “New” → “Google Slides”. 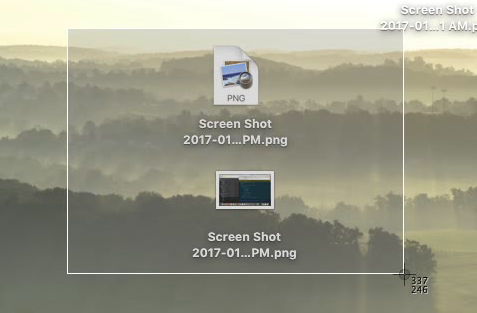 Another way to take a screenshot is with the Microsoft Snipping tool. Click on the Windows key on your keyboard, and type “snip”. 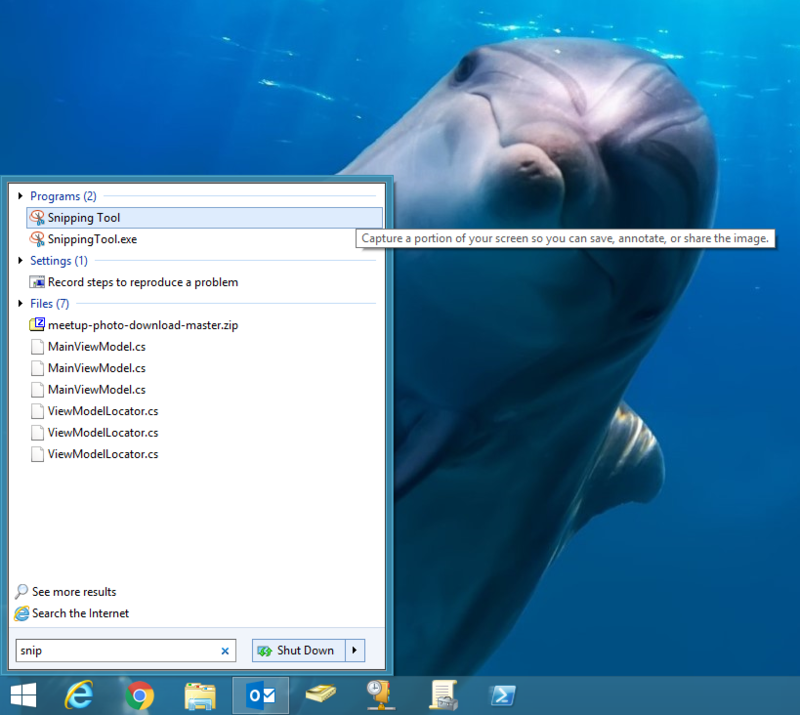 Now click on the Snipping Tool program. Click “New” and drag a selection around the area you want to capture. Then you’ll be able to save it or copy it, and you can draw on it too! On Mac, press command + shift + 4, and you will be able to drag a box around the part of your screen you would like to capture. This will place a new image file on your desktop. Taking a screen shot can be a very useful thing to do. You can share a snapshot of part or all of your screen with anyone in just seconds. Now you can paste the image of your screen almost anywhere. Open a new email, a Word document, or Paint (or any other program where you can paste an image) and press Ctrl + V.
On Mac, press command + shift + 3 to capture your entire screen. 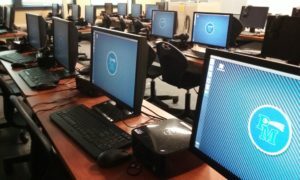 Today I took a closer look at ABCYa.com, a website on the grow page for all our elementary computers. ABCYa claims to be a “teacher-created” website, and offers a very large selection of educational games that fall into the following categories: Letters, Numbers, Holiday, Strategy, and Skills. 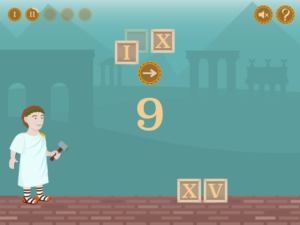 Games on the website are geared for grades pre-K through grade 5. They are divided first by grade level, and then by category. I was happily surprised to find that there is no need to sign up, and all the activities are free. There is an option to pay to remove ads, but the ads are safe and don’t get in the way. Here is a glimpse of one of their numbers games that teachers Roman Numerals. Starting on January 17th and 18th, a select group of students in 6th grade at Central Manor and 5th and 6th grade at LeTort will have the chance to interact more with technology in a new Tech Club over lunch recess. This is a win-win project for student, teacher, and tech. Students will be exposed to technology in a more hands on way and will learn how computers work, and how to use different software to do various tasks. Several students from each class might be interested, but the teachers will choose only two that will participate. They will be able to choose this based on the student’s performance, grades, attitude, and any other factors that they feel are important. Since not every student that’s interested will be able to participate, teacher’s will be able to leverage the club as motivation. And of course, as these students will be helping to do some simple tasks, this will free me to handle things that I wouldn’t otherwise be able to. The laptop carts require repetitive care from time to time, and an ever moving inventory can be hard to keep track of. Students have until the end of next week to fill out a Google form with their interest in the club. Technology can be scary. In this new digital age, we’re surrounded by new-fangled surprises of innovation that can be intimidating to approach. But we see the advantages of this new tech, and want to use it. How can we make the best of it without the headaches and the stress? I’ll attempt to answer that today in this post. Life is usually a consistent cycle. One day rolls to the next and we build on our habits. But now and again, we have a bad day. All it takes is a little mishap, and our world comes crashing down. When we have a set of habits in an ordinary day, and one of those habits is interrupted because of a technology failure, it really breaks our momentum. As a technologist, I’m not immune to this phenomenon (as you can see in the image on the right). In fact, in order to become a technologist, it was very important for me to learn why this happens to us and what to do to overcome it. Our fear of technology is based on the experiences we have with it. Every interaction with technology is a reinforcement of our opinion of technology, whether positive or negative. As a result, every negative experience we have feeds our distrust for this complex blob of electronics that we don’t fully understand. The big question then is, what can we do about it? How can we overcome this labyrinth if we know there are going to be failures? There are three things that I think are key to getting past the barriers. There is probably a reason you have this technology in front of you right now, so make yourself aware of what you plan to accomplish with it and how you can best do that. This sometimes means doing some exploration and learning about new features of software or new ways of doing things. The second step is to maintain a positive attitude while using technology. Because the tech is just a means to an end, we often want to overlook it and ignore it. It’s easy to get impatient and begin reacting to an already overloaded computer. Take your time and allow the technology to play a part in what you’re doing. If you put a little of your own focus on technology, your audience will not notice the technology as much, because instead of being a distraction, it will move smoothly behind the scenes. Before you do something “for real”, practice by walking through exactly what you plan to do. You should do this anytime before you present, or make anything live to the world. Testing is key when using tech regardless of what you’re using it for. The outcomes of a set of actions on a computer are almost always identical, so you will usually find flaws in the process the first time you do it. A computer is a very powerful thing. The reason that I’ve given so much of my life to this world of circuits is because it opens the door to an endless supply of interesting things to learn and explore. From architecture to medicine, from science to art, everything can be made better and easier with technology, including and especially education. Not how much you know, but rather how you approach it is the biggest factor in what technology will do for you.